This week was very exciting for some friends and I. 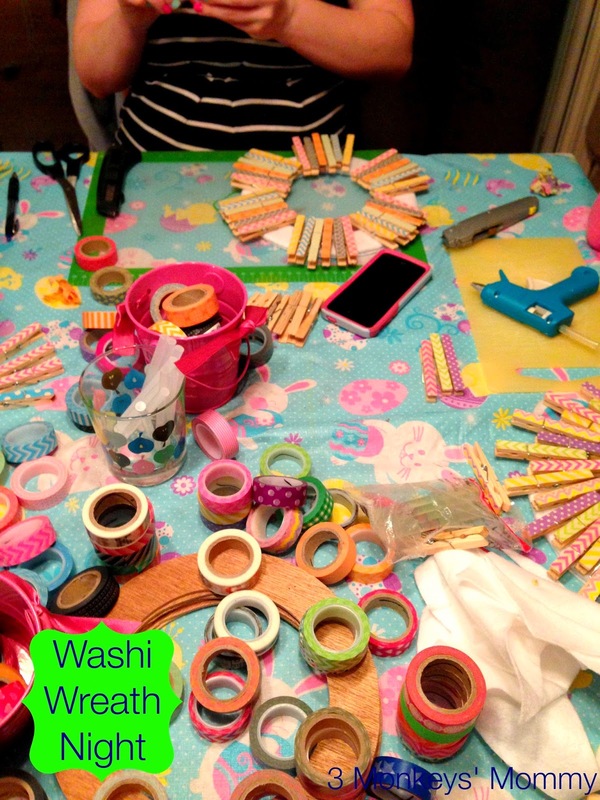 We have decided to start a craft group and we are going to have either monthly or bi-monthly get togethers where we will create something wonderful. 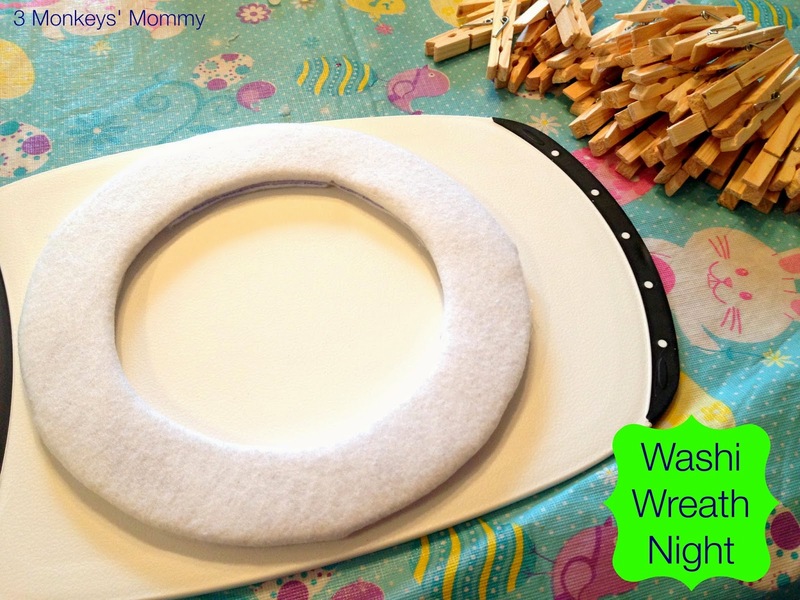 We decided that for our very first event, we would plan a craft that we would all do and see how it went. In future, we will probably do some nights with a plan and some where we just bring whatever we are working on and go to town! 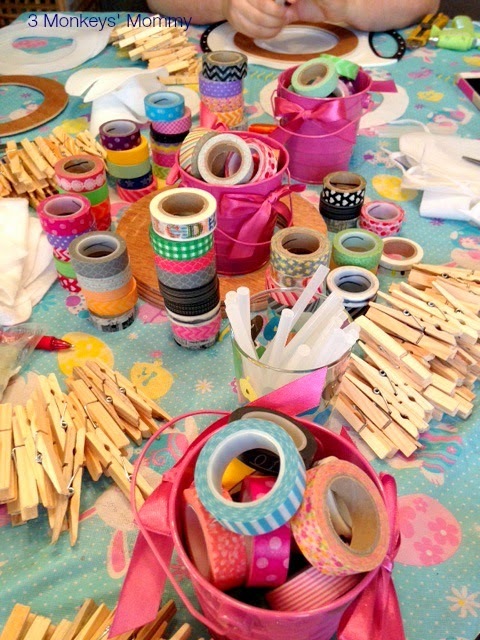 Since a few of us are totally addicted to washi tape, we called our little group Washi Anonymous. We even made a Facebook group to organize and plan and inspire each other. I am so happy that we have started this group for a number of reasons. Now that we have had our first event I am pretty sure the #1 reason I love it is for the awesome girl time! 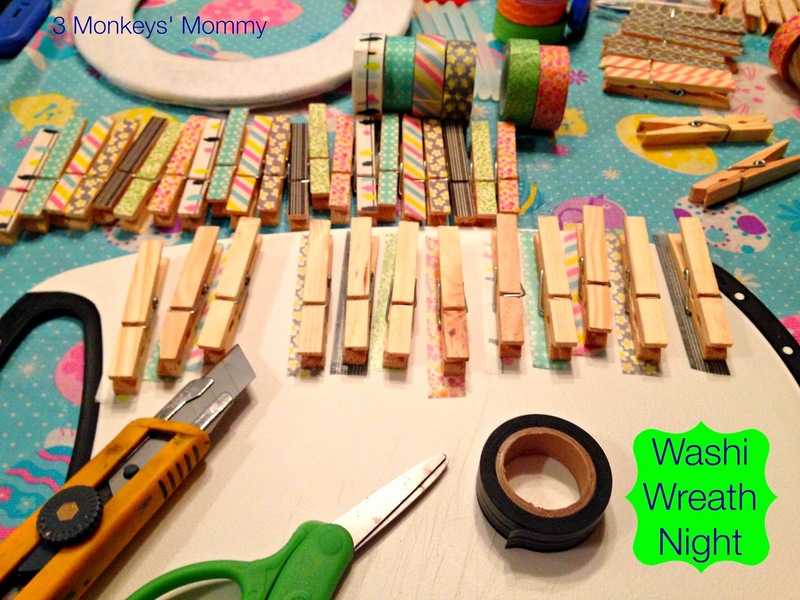 We crafted and chatted and ate yummy snacks! It was so refreshing! We found the inspiration for the wreaths on Pinterest (I'm having trouble viewing the original link today). These were so fun and easy to make! 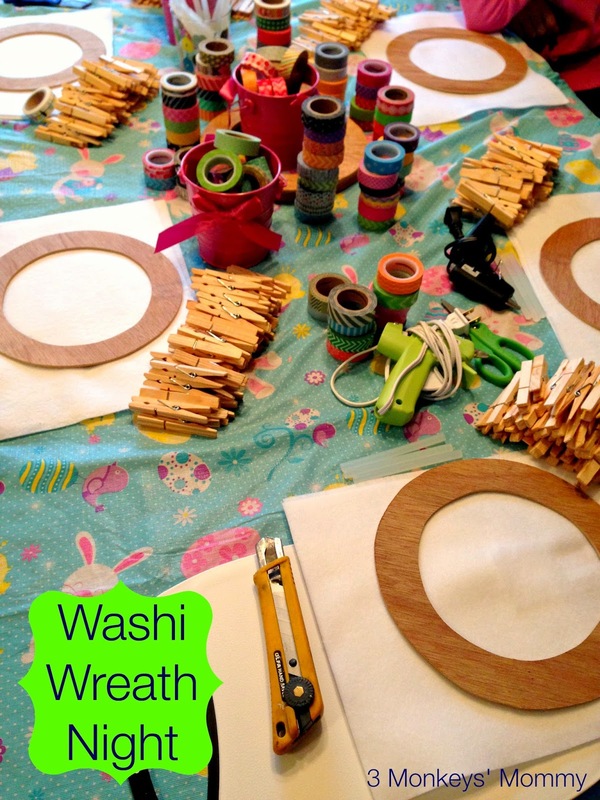 Here are some modified instructions for this beautiful Washi Wreath! 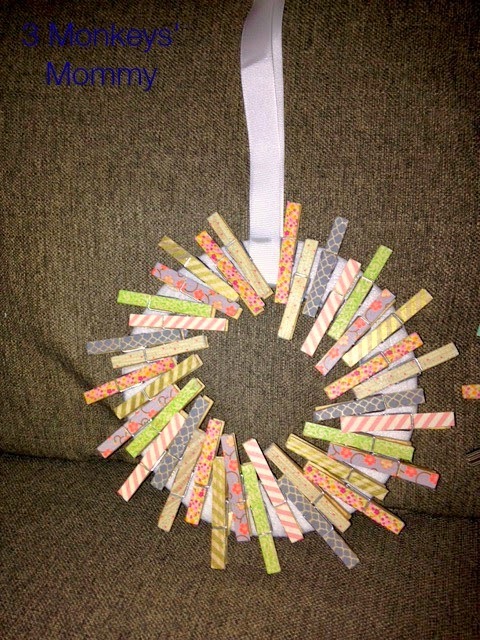 We tweaked if for a few reasons... 1) so that the clothespins are useable as clips to put photos or other items on the wreath and 2) to seal the pins with Mod Podge so that it can be used on an outside door. 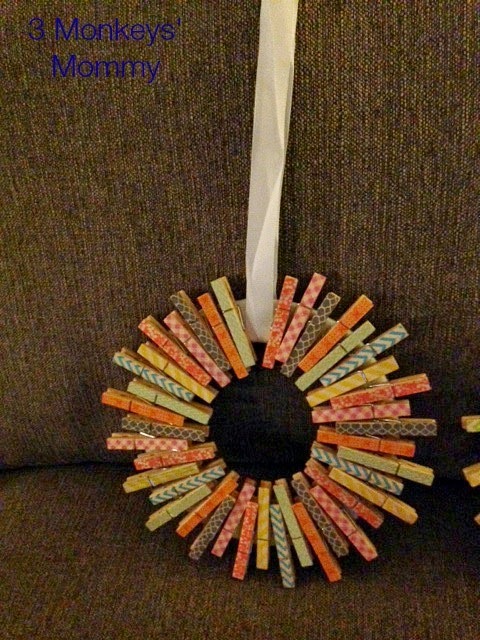 The original tutorial called for thick cardboard as the wreath form. We decided that, as we would likely be wanting to use the wreaths on outside doors, we wanted something that would hold up to the elements. We had the forms cut from a sturdy chipboard. First, trace around the wreath form onto the felt. White or light colours are a good choice for the felt as there are bits that you will be able to see through the pins when the wreath is finished. For the first side, leave about a 1/2 inch border around the wreath form as you will glue the felt around the edges of the form to secure it. 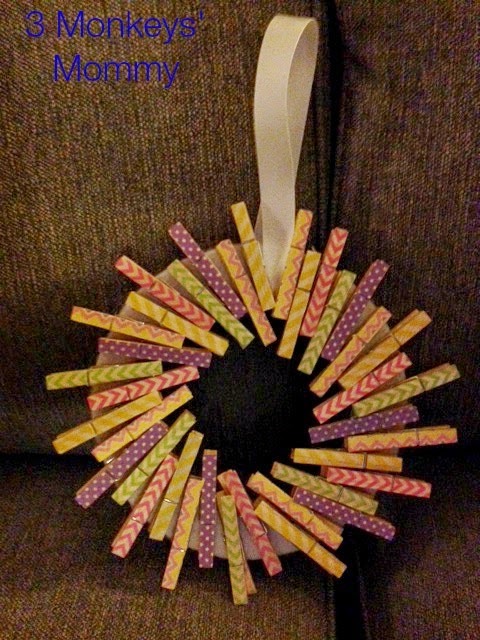 The second piece can be cut to the same size as the wreath form. 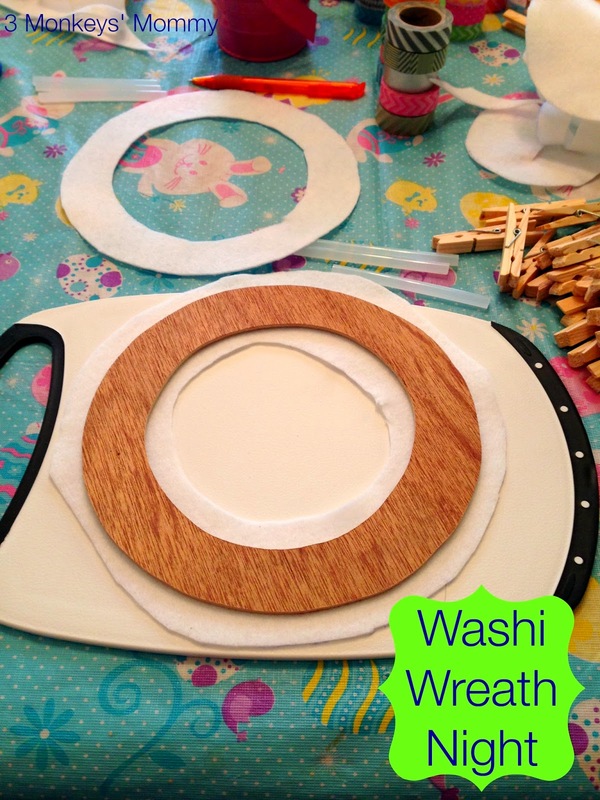 Using the glue gun, stretch the larger cut of felt around the wreath form and glue the edges down. Then place the smaller cut of felt on top and glue it down in place. 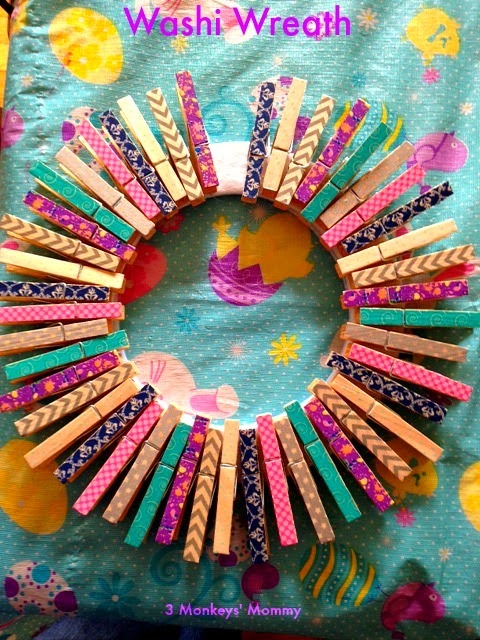 The next step is to cover the clothespins with washi tape. This is easily done by lining up the top of the pin and one side with the edge of the tape, and then using the utility knife to cut the excess tape off of the other two sides. The pins also look super cute when you cut the tape that goes across where the metal clip goes through. Looks super sharp! 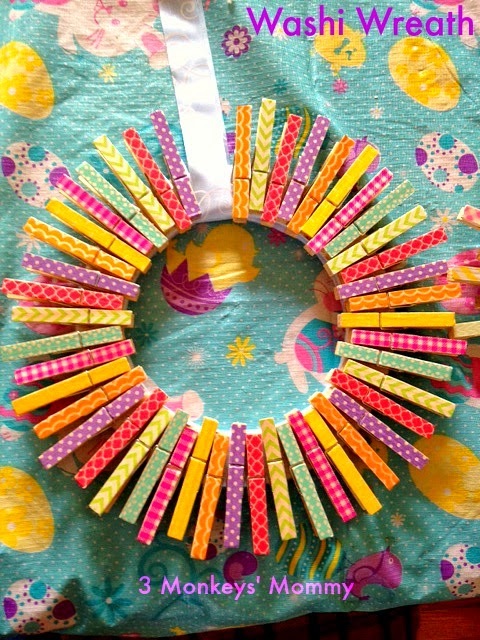 Once you've got the pins all done and the wreath ready, its time to hot glue the pins in the pattern that you want. 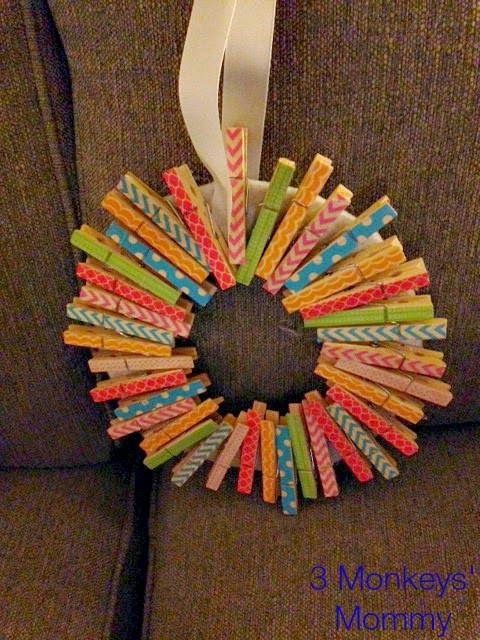 They look best if they are staggered a bit and the best way to line them up to keep a round wreath is to place one with the end of the pin flush with the inner circle of the wreath, and the next one just slightly lower. You will have to space them out slightly with the inner ends touching in a fanlike shape to keep the circular shape of the wreath. You can place them either with the clip facing outward (so that you can clip items around your wreath) or inward (and you could clip a photo in the centre of the wreath). I absolutely love how they all turned out! 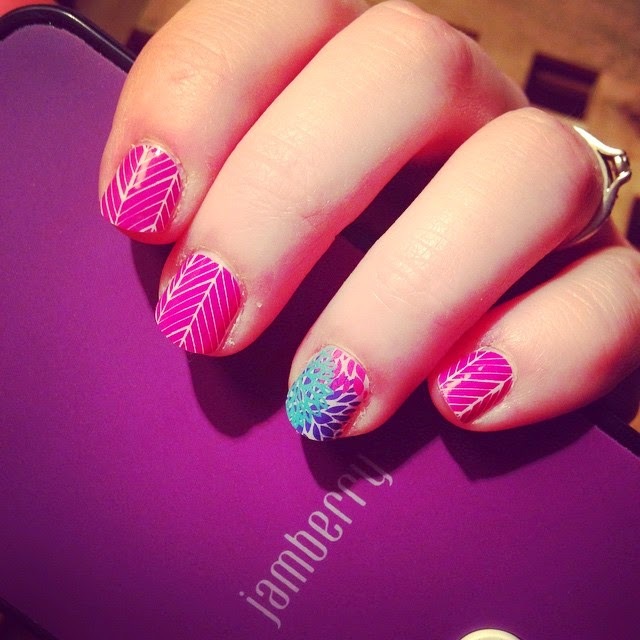 Its pretty neat that they all different in the patterns of the placement of the pins, and that they all look great! 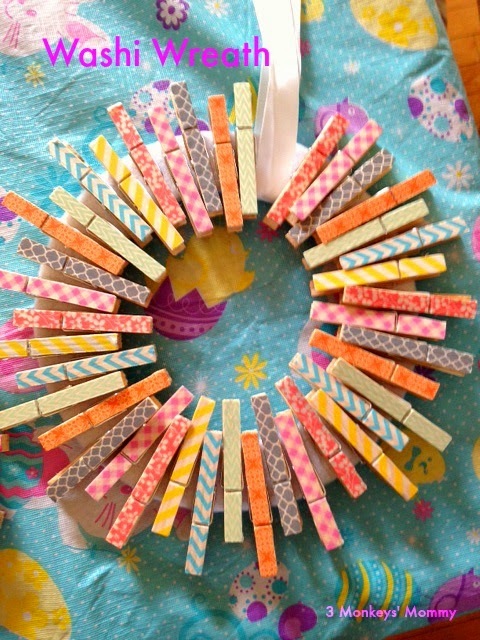 Once they are finished, its a great idea to seal the pins with Mod Podge. 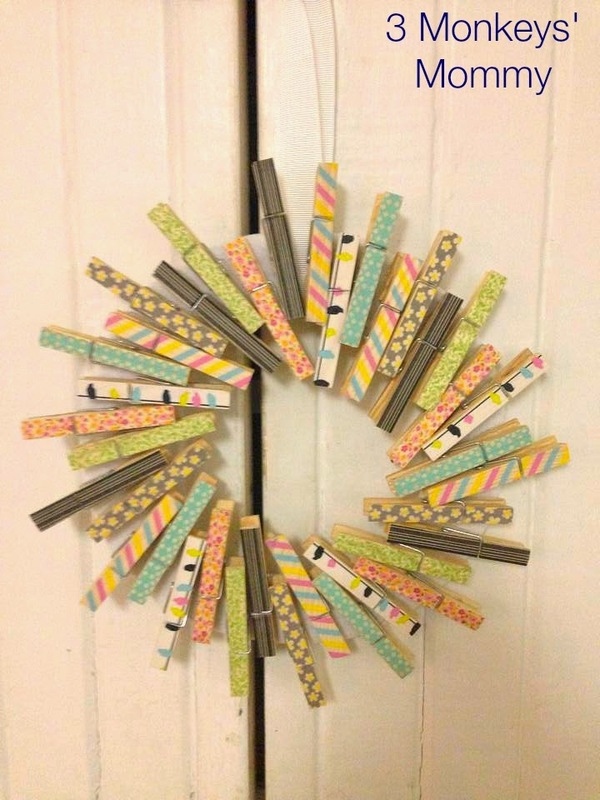 This gives the wreath a great look and it makes the wreath outdoor friendly. I just took a sponge brush and painted a thin layer of Mod Podge over each pin. Its easiest to do this with the pins already glued in place. I did it with them loose for one wreath and it took a lot longer. Looks the same either way.